Read more about the Feb. 6-16 tour of former U.S. President Jimmy Carter, former First Lady Rosalynn Carter, and Carter Center leaders to Center-sponsored health work sites in four African countries. NASARAWA NORTH, Nigeria…Today, former U.S. President Jimmy Carter and Rosalynn Carter watched as hundreds of school children received drug treatment for schistosomiasis, a silent and destructive parasitic infection that leads to poor growth and impaired learning, in the small community of Nasarawa North. President Carter visited the highly affected community to bring national attention to the country's need to make disease prevention methods and treatments with the medicine praziquantel more accessible in its rural and impoverished communities. President Carter was joined on the field visit by senior officials from The Carter Center, national health experts, and Nigeria's former Head of State General Dr. Yakubu Gowon. "Communities once weakened by schistosomiasis and other neglected diseases can become stronger thanks to the dedication of local health workers distributing simple, preventative drug treatments annually," said President Carter. "Watching these children smile and knowing that they have the opportunity to grow up no longer fearing the blindness, disfigurement, and organ damage that their parents suffered is a testament to the bright future of Nigeria. To make this vision a reality, however, the Nigerian government must pledge more financial and political support and ensure the dedication of officials throughout the country." The visit to Nasarawa North comes a day after President Carter's meeting with Nigeria President Olusegun Aremu Obasanjo to request further governmental support to help Carter Center-assisted programs combat schistosomiasis and other neglected diseases in the most populous African country that has more people at risk for schistosomiasis, river blindness (onchocerciasis), and lymphatic filariasis than any other nation on the continent. Nigeria's disease burden is staggering even on a global scale. An estimated 30 million Nigerians, more than any other country in the world, need to be treated routinely with praziquantel. The country is the most highly endemic country in the world for river blindness, a parasitic infection that causes intense itching, skin discoloration, and potential blindness and the third-most endemic for lymphatic filariasis, a parasitic disease transmitted by mosquitoes that causes permanent disability. The Carter Center, in partnership with Nigerian health authorities, has created a village-based health care delivery infrastructure to treat multiple diseases simultaneously. By merging resources, health education, and drug distribution for several diseases into one delivery system, isolated communities become healthier. Currently, The Carter Center provides more than a quarter of the approximately 20 million drug treatments delivered annually to treat river blindness. The Carter Center-assisted lymphatic filariasis and schistosomiasis programs are currently the largest initiatives treating the two diseases in the country. Unlike the drugs used to fight river blindness and lymphatic filariasis, no company donates praziquantel on a large scale, so the Center's treatment for schistosomiasis is limited to the amount it can afford to purchase. Now, with the support of the Bill & Melinda Gates Foundation, The Carter Center will expand its integrated disease prevention assistance in central Nigeria, as well as pioneer distribution of long-lasting insecticide-treated bed nets to prevent both lymphatic filariasis and malaria. In 2007, the program plans to distribute at least 200,000 impregnated bed nets in Nigeria's Plateau and Nasarawa states and some of the southeastern states to combat lymphatic filariasis. "Most people in rural areas are farmers, and when you have a debilitating disease like schistosomiasis, lymphatic filariasis, or river blindness, you can become incapacitated, unable to continue your work," said Dr. Emmanuel Miri, resident technical adviser for the Carter Center's health programs in Nigeria. "By preventing and treating these diseases through drug distribution and health education, we are freeing the next generation from a cycle poverty and disease." The Carter Center-assisted village-based prevention and surveillance system in Nigeria was first established in 1988 when the campaign to eradicate Guinea worm disease began in the country. As chairman of the board of trustees of the Yakubu Gowon Center, General Gowon has been a key advocate in the eradication effort in Nigeria since 1999. He has made 69 visits to 123 endemic villages over the past eight years. Once the most Guinea worm-endemic country in the world, reporting more than 650,000 cases in 1989, Nigeria reached a major milestone when it reported only 16 cases of Guinea worm disease in 2006. It is likely that Nigeria will completely end transmission in 2007. To ensure the country's success in eliminating the disease, it remains important that Nigerians report any suspected cases of Guinea worm to health authorities immediately. President Carter's visit to Nigeria comes on the heels of General Gowon's visit to The Carter Center headquarters last November to receive The Jimmy and Rosalynn Carter Award for Guinea Worm Eradication alongside Dr. Miri. The award was presented to them for their major roles in Nigeria's impending victory over Guinea worm disease. "This astounding success of the national Guinea Worm Eradication Program is due to the hard work of thousands of Guinea worm volunteers in hundreds of isolated villages across the country," said General Gowon. "Because of them, there is new hope that despite daunting obstacles, Nigeria can make lasting improvements for her people." Former U.S. President Jimmy Carter will call international attention to health needs among impoverished communities in Ghana, Sudan, Ethiopia, and Nigeria, when he leads a delegation of senior-level Carter Center officials to Africa on Feb. 6-16. The Carter Center celebrates its 25th anniversary in 2007. A not-for-profit, nongovernmental organization, The Carter Center has made tremendous contribution to improving life and alleviating human suffering in more than 65 countries around the world by resolving conflicts; advancing democracy, human rights, and economic opportunity; preventing diseases; improving mental health care; and teaching farmers to increase crop production. The Carter Center was founded in 1982 by former U.S. President Jimmy Carter and his wife, Rosalynn, in partnership with Emory University, to advance peace and health worldwide. 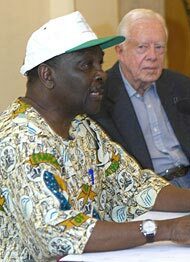 Former Nigerian President General Yakubu Gowan (left) and former U.S. President Jimmy Carter hold a press conference Feb. 15, 2007, in Abuja, Nigeria. Former U.S. President Jimmy Carter, with former First Lady Rosalynn Carter, read a sign held up by school children in a Nasarawa State village, which reads "Bilharzia (schistosomiasis) watch out. Here comes Jimmy Carter." Young boys present their vials of urine colored red from schistosomiasis infection to Carter Center Executive Director John Hardman, M.D. (center right), Frank O. Richards, Jr., M.D. (left), director of the Carter Center's River Blindness, Lymphatic Filariasis, and Schistosomiasis Control Programs, former U.S. President Jimmy Carter, and other delegation members. 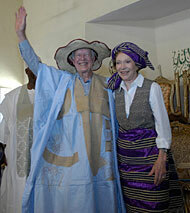 Dressed in Nigerian finery, former U.S. President Jimmy Carter and former First Lady Rosalynn Carter greet guests Feb. 15, 2007, at the Emir's Palace in Nasarawa State, Nigeria.